I learned only recently that there’s an Egypt Society of Bristol. They have a fabulous logo, with Anubis floating over the Suspension Bridge, a scene that I’d love to see in a B-movie. It also makes me think of how fierce the bridge would look if Brunel had topped it with sphinxes, as he’d initially planned. Their March lecture was called Going Forth by Night: the mummy in literature and film, with John J. Johnston, who co-organised my favourite conference ever, Monstrous Antiquities, back in 2013. I’m still kicking myself for having missed it, but luckily I learned about the June lecture in time, since the topic couldn’t be more fascinating: Ancient Egyptian demons. 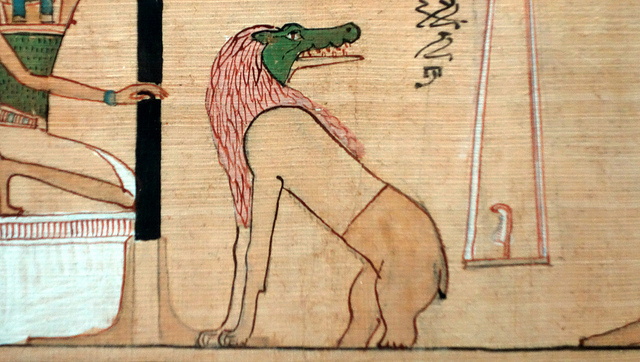 Hunefer’s Book of the Dead, detail of Ammit. Hunefer’s Judgement in the presence of Osiris, Book of the Dead, 19th Dynasty, New Kingdom, c. 1275 B.C.E., papyrus, Thebes, Egypt (British Museum) via Steven Zucker. These liminal entities could be benevolent or hostile, but, in Dr. Kasia Szpakowska’s words, their nature was “in the eye of the beholder”. This, to me, is deeply unsettling. If you’re a supernatural entity, please don’t put this weight on my shoulders. The demons were depicted on objects of different kinds, presumably serving different functions. The fact that they appear on headrests, next to spells that promote a peaceful sleep, was the most intriguing. It made me think of the different masks that night horrors have worn through history. What abominations did the Egyptians imagine lurking in the realm of sleep? What did they need to be protected from? I haven’t done my research, so I don’t have an answer. But the exciting news is that there will be a full conference on the subject in March next year, Demon Things. In the meantime, there’s also a blog with daily demons and other curiosities.